The world today is really in a very critically precarious state – nuclear bombs, so much hatred and conflict within religions, nations and races. The ecology is being exploited in so many ways which endangers so much of the life we know. There is a need for real change. If we want to clean the ecology of the world we really have to concentrate on cleaning the ecology of our own mind – greed. Unless we change ourselves we can’t really be a part of real solution. Real spirituality, religion, dharma is transformation. Transformation of arrogance into humility, greed to generosity, hate into love, vengeance into forgiveness, agitation into peace, darkness into light. Within the world, whatever knowledge we have, whatever money we have, whatever skills we have – they could potentially be of great benefit or they could be very destructive – depending on our motives, wisdom and our character. A magnificent, ornate hall may be there, but what holds it up is its foundation. As we are trying to build our lives through our education, occupation and different relationships, we should also be very much focused on having a strong foundation within our lives, wherein we can maintain character, integrity, and spiritual wisdom even when there is the temptation that we can get so much more if we just compromise ourselves. For this we need a strong spiritual foundation. Spirituality or religion is not necessarily about becoming a swami or a priest – its about balancing our lives with this foundation, being an instrument of compassion. Whether we are engineers, doctors, teachers, mothers, swamis, or priests – if we perform our duties in a spirit of devotion, with wisdom, then we can make a real change in the world and that cleanses the ecology of the heart. In Bhakti yoga the powerful recommendation is chanting God’s names. Mantra means to free the mind of the ecological pollutions of greed, envy and anger. And the sound vibration of the Maha-Mantra serves that purpose. And in the Christian, Jewish etc, traditions there are transcendental sounds, prayers and ways in which we endeavor to cleanse the heart – to come in contact with the spiritual power, with this grace that gives us the foundation that whatever we do in our life, we can build something wonderful and make some real changes in the world that we live in. We all have that opportunity and this is so exciting. Life really is an adventure if we see it from this prospective. There are infinite possibilities of how we can do something wonderful in this world, because the Divine’s grace is infinite. It is beyond us if we just tune in and connect with loving, devotional service to Krishna (God). Editor: As an aside, for those who don’t recognize the man in the banner for this article, it is Rupa Raghunatha Prabhu. Rupa is one of most selfless humans I’ve ever had the privilege of meeting. 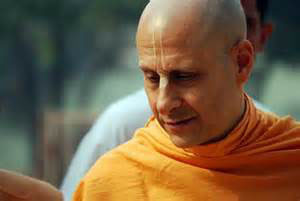 He founded and directs the Sandipani Muni Schools in Vrindavan, India. He is humble and hard working, and his whole life is committed to serving the poorest children (and their families) of the Mathura area. His is an ecology of compassion.